A sand truck treats icy patches along Coit Blvd. in Dallas before morning rush hour in 2008. Snow is expected on Sunday and Dallas says its Emergency Management Office and other city departments are getting ready. 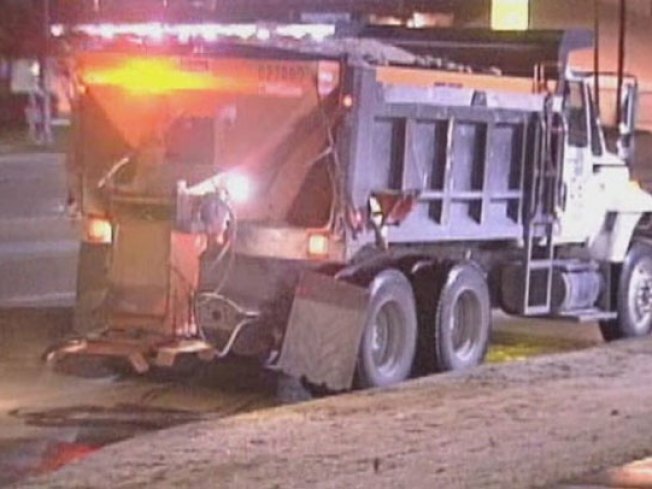 Street crews are already on stand-by to activate "Ice Force One" which means 30 sanding trucks hit the streets, crews are also on stand-by in case the city elevates to "Ice Force Two" which would double the number of crews on the street. Turn off your sprinklers tonight, Code Compliance officers will be watching for residents and businesses who have their sprinklers on in cold weather. The fine for violating the city code is $250 to $2,000 per incident. Should there be any water main breaks, Dallas Water Utilities repair crews are also on stand-by. Operation Code Blue will be locating homeless people and taking them to the Bridge, the city's homeless assistance center. The city reminds people to bring in outdoor pets during cold weather.